Water softeners are useful when your tap water is "hard" and you don't like it that way. Properly installed and stocked with water softener supplies, they soften household water. You may need to turn off a water softener for one of a number of reasons, including when you are heading out on vacation. Turning the water softener bypass valve is all that is required, usually, but you can cut the water to your home and unplug the machine, as well. 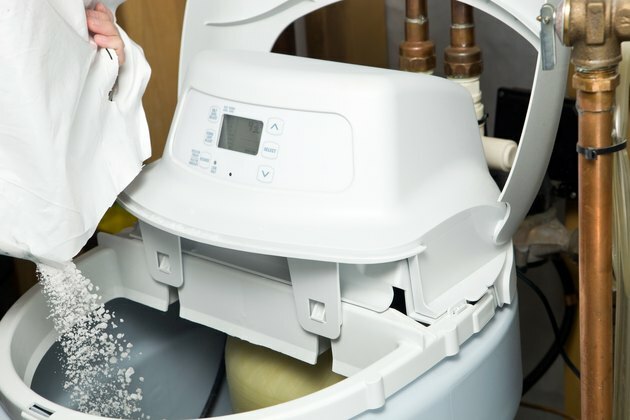 A water softener is an appliance that makes hard water softer. Water is considered hard if it has a high mineral content, while in soft water, those minerals — mostly calcium and magnesium metal cations — are removed. Your water softener has three different modes: Service, regeneration and bypass. When it is in the service mode, the water softener is working as intended, softening the water in your home. When the machine is in the regeneration mode, it is essentially recharging itself for the next service period. Finally, if you adjust it into the bypass mode, the water softener action is no longer at work, and the machine permits untreated hard water to run through your faucets when they are open. Using the water softener bypass valve — sometimes called the water softener shut off valve — means that the water softening function of your appliance will be turned off. This allows regular water to flow into your bathroom and kitchen, rather than softened water. To accomplish this, trace the hoses in the back of the water softener to where they connect with the copper water pipes. You'll find three valves there that turn one way for soft water and the other way for bypass. Usually, they are marked with arrows indicating which way to turn for which result. Turn all three valves in the direction of bypass, if that is marked. If only "soft" is marked, turn all three valves in the opposite direction of the SOFT arrow. At this point, your appliance is in bypass mode. That means that ordinary hard water will flow to the property. If you are thinking of turning off the water softener while on vacation, it's a good idea. You might turn off the water, as well, to eliminate the possibility of leaks. Turn the valves to bypass as a first step, then cut off the water to the house. You can usually do this with a valve near the water meter. At this point, unplug the water softener and you are good to go. How Does a Soft Water Loop Work?